WILLEMSTAD - The government has decided to maintain the hiring freeze after the financial instructions were dismissed by the Kingdom Council of Ministers. At present, there are 73 civil servants who are non-active, but do receive 100 percent salary. This will cost the government 6.4 million per year. “The law indicates that a government employee who has been inactive for more than two years should be paid 90 percent of his or her salary. 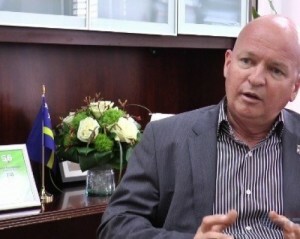 If it’s three or more years, then it is 80 percent,” Minister Etienne van der Horst of Policy, Planning and Services said. A recent research has shown that there is a group of people who have been at home but get paid in full. The minister says that he wants to reduce these payments by late March. Van der Horst was not able to say if this measure will lead to major savings for the government. In addition, Van der Horst wants people to undergo a medical re-examination. He expects that this will happen during the first half of the year.